The Fundome Slide is a Fun Explosion!" 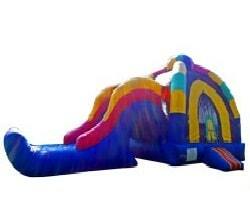 This slide jumper includes a big bounce area with a climbing wall and slide. The return trip into the bouncing area is even better crossing under the slide through the inflatable tunnel!